Conclusion (yes, im starting with a conclusion): Sore bum. As a foreigner in Thailand, if you wish to stay for any length of time, you will usually get acquainted with visa trips. These can be frequent, depending on your visa type. For this particular trip i headed to the Thailand/Burma border (more info on how to do a border visa trip here < to come later, sorry). I decided, unwisely maybe, to set off early. Like 6:30am early. Now i know that i am of Scottish blood, but i have lived in Thailand long enough to have acclimatized. I have also always hated the cold and been able to cope with the heat. So, at 6:30am riding in cool season temperatures, i did not find it fun. In fact, i had to slow my pace right down because the wind and cold was going straight through me. Wearing three layers, a jumper, a jacket with a windproof jacket on top, just didn’t cut it and body was shivering so violently that i thought my bike was having issues! Really! Thankfully there is a great little spot for warming up just before you hit the city of Chiang Rai. The Hot Springs at Mae Khachan. I parked up and nipped into the coffee shop where they pump in hot spring water into troughs. Here you can soak your feet, whilst drinking your coffee. My hands in particular reveled in the heat, as they had gone quite numb. After warming up (wasting a good hour or so doing so), i carried on up to Mae Sai, the border town into Burma. Visa sorted i grabbed a bite to eat and started off back to Chiang Mai. Except i didn’t. Now i didn’t actually intend to head to Phayao, my plan was a quick trip up to the border and back again. 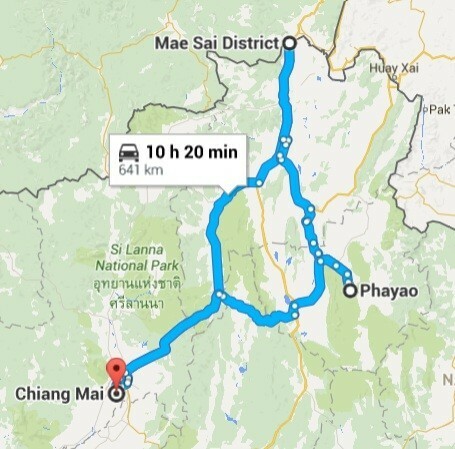 However, me being me (aka – stupid), i missed the Chiang Mai road turn off and found myself heading towards Phayao. I decided i may as well just go into Phayao and make it a day trip. Phayao itself is a pretty town. Some find it a little boring, but i find it peaceful. I love the Naga serpents on the water. After a quick view i headed back to Chiang Mai, arriving a couple of hours later. If you have done a “visa run” before, where did you go to? Love Phayou, i drive over there quite alot and stay overnight in the phuglong hotel, great place and good night life, usually drive up to chiang rai after then chiang khong.